25mm slogan badge. 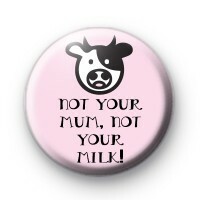 This light pink badge has a very popular Vegan saying 'Not Your Mum, Not your MILK with an illustration of a cow at the top. There are so many milk alternatives now that we really do not need to be drinking dairy. This is a great badge for any proud Vegan and with it pinned to your coat it will be a great way to start conversations about Veganism.